The ancient Greek tragedy written by Euripides will be played at Experimental Theater “Kujtim Spahivogli” on February 3, 4, 7, 8, 9, at 19.00. The play will be on stage under the direction of Dimitris Mylonas. 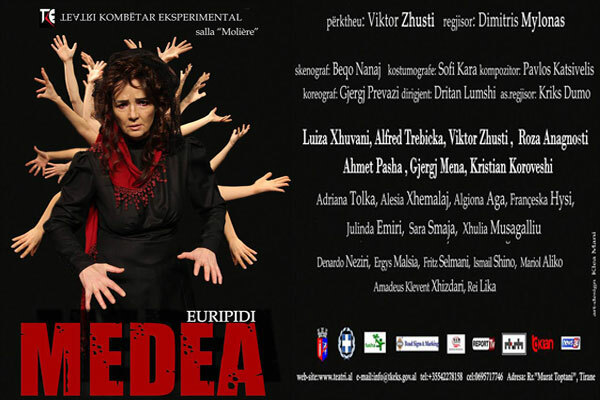 Albanian cast: Luiza Xhvani, Alfred Trebicka, Viktor Zhusti, Roza Anagnosti, Ahmet Pasha, Gjergj Mena, Kristian Koroveshi, Adriana Tolka, Alesia Xhemalaj, Algiona Aga, Franceska Hysi, Julinda Emiri, Sara Smaja, Xhulia Musagalliu, Benardo Meziri, Ergys Malsia, Fritz Selmani, Ismail Shino, Mariol Aliko, Amadeus Klevent Xhizdari, Rei Lika. Plot Medea is an ancient Greek tragedy written by Euripides, based upon the myth of Jason and Medea and first produced in 431 BC. The plot centers on the actions of Medea, a former princess of the "barbarian" kingdom of Colchis, and the wife of Jason; she finds her position in the Greek world threatened as Jason leaves her for a Greek princess of Corinth. Medea takes vengeance on Jason by killing Jason's new wife as well as her own children, after which she escapes to Athens to start a new life. Considered shocking to Euripides' contemporaries, Medea and the suite of plays that it accompanied in the City Dionysia festival came last in the festival that year. Nonetheless the play remained part of the tragedic repertoire, and experienced renewed interest with the emergence of the feminist movement, because of its nuanced and sympathetic portrayal of Medea's struggle to take charge of her own life in a male-dominated world. The play has remained the most frequently performed Greek tragedy through the 20th century.